Eugene. You're silly. I'm more afraid than you. *sigh* I have to try and upload some pictures of myself before the year is out. 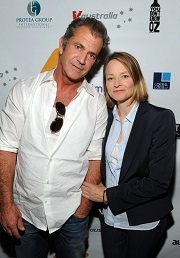 JF at The Hollywood Reporter next Generation reception on 5/11/11. She looks like a little girl in theis photo. Now i need oxygen to recover. Not me. I feel like I just got a shot in the arm of the best stuff on earth. I haven't seen this one before. Thanx, Silverline. Absolutely stunning photos! The little dude wrecking his puter is so cute! Well, that's the spitting image of me when im on it whether i have internet or not. But i know how it feels when you can't go on. Glad you are back. Yay, Eugene! You do come up with the cutest emoticons. But I'll drink to JF anytime. Jodie Foster arrives at the premiere of Warner Bros. Pictures' "Sherlock Holmes: A Game Of Shadows" held at the Regency Village Theatre on December 6, 2011 in Westwood, California. Thanks, Eugene. You do too much as it is. Keeping the home fires burning and all. Here is a little pressie for you my dears....so you can forgive me for not having been around so long. Pic is fresh from yesterday 6/2/12.